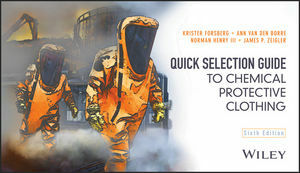 This best selling pocket guide is the an essential field source for HazMat teams, spill responder, safety professionals, chemists and chemical engineers, industrial hygienists, supervisors, purchase agents, salespeople and other users of chemical protective clothing. KRISTER FORSBERG is an internationally recognized expert on protective clothing. He has been an active member of ASTM Committee F23 on Personal Protective Clothing and Equipment and convenor of EN 374Chemical and micro-organism within CEN/TC162. ANN VAN DEN BORRE is currently active as Sr. Technical Manager at Ansell Healthcare, advising customers to find the best solution. She has been working in this Personal Protective Equipment sector for 15 years. With a Master of Engineering Sciences in Chemistry, Ann has specialized in chemical protective clothing materials and the mechanism of permeation breakthrough. NORMAN HENRY III is a retired DuPont Senior Research Chemist and Certified Industrial Hygienist (CIH). He was active in ASTM Committee F23 on Personal Protective Clothing and Equipment during the development of the permeation test method F-739, is a member of AIHA's Protective Clothing and Equipment committee, and has expertise in protective clothing testing and evaluation. JAMES P. ZEIGLER spent 19 years working on chemical protective apparel materials at DuPont before retiring in 2011. Dr. Zeigler was co-inventor of many of DuPont's chemical protective apparel fabrics. He is currently chairman of the ASTM chemical protective clothing sub-committee and a 21-year member of the NFPA Technical Committee for Hazardous Materials Protective Clothing and Equipment.